Call today for a free auto body repair quote! Seniors And Dealerships Get a Special Rate Everyday! Welcome to SK Auto Body Frame Shop and Collision Center! 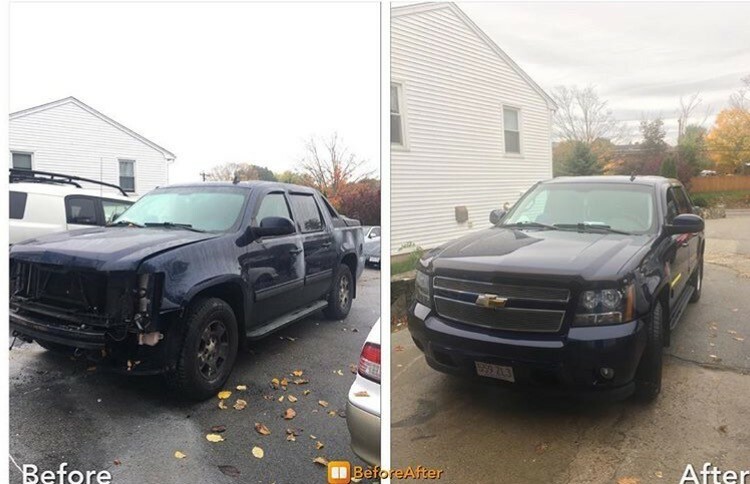 For over 15 years SK Auto Body has been providing Northern Massachusetts including Methuen, MA, Lawrence, MA, Haverhill, MA, along with Plaistow and Salem, NH, with unbeatable customer service and quality auto body repair. For professional auto detailing and repair work, call the premier auto body shop in Methuen, MA. Auto body repair is something you want to get right the first time. Your vehicle is one of your biggest investments and most people rely on their cars every day. When it is damaged, it needs to be prepared to prevent further damage and danger. Our auto body shop provides expert repair at an affordable rate to get you back on the road as soon as possible. Our auto body repairs are performed by the best technicians using the best possible materials. All auto detailing and repair work is guaranteed by our shop’s warranty. 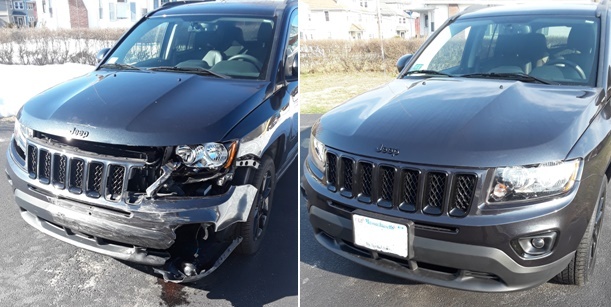 Our auto body shop is well equipped with the latest equipment that allows us to provide the highest quality collision repair on any of today’s vehicles. We offer great auto detailing service! Many people aren't sure of the difference between regular car washes and auto detailing service. The difference is in the level of care: the aim of a good car detailer is to make your vehicle look brand new again. When you sign up for auto detailing service, we will completely clean and recondition your car from top to bottom. A car wash only covers a fraction of the work we do during detailing. We will thoroughly wash the outside of your car, including polishing the paint, shining the windows, and removing all dirt from the wheels. We'll also vacuum and shampoo your vehicle's interior. An occasional deep clean will help your car look its best, repel dirt and grit, and help your vehicle last longer. We can even clean the engine bay during our auto detailing session in order to make working on your vehicle a breeze! SK Auto Body is here for you. We want to make sure you don’t end up in an unsafe or cheap auto body shop just because an insurance company can be misleading. When an insurance company insists you use a “preferred” shop, it is called insurance steering and it is illegal. These shops often use imitation parts and other discounts to save the insurance company money. This is detrimental to the quality of the auto body repair job. In order to get a reliable, safe repair, call SK Auto. We negotiate with all insurance companies on your behalf to ensure that you receive quality, safe collision repairs that will last for years to come. If your vehicle is in good repair but needs a thorough cleaning, we can handle that, too. As part of our auto detailing services, we will thoroughly clean and recondition your automobile. We can make your vehicle look its best inside and out. 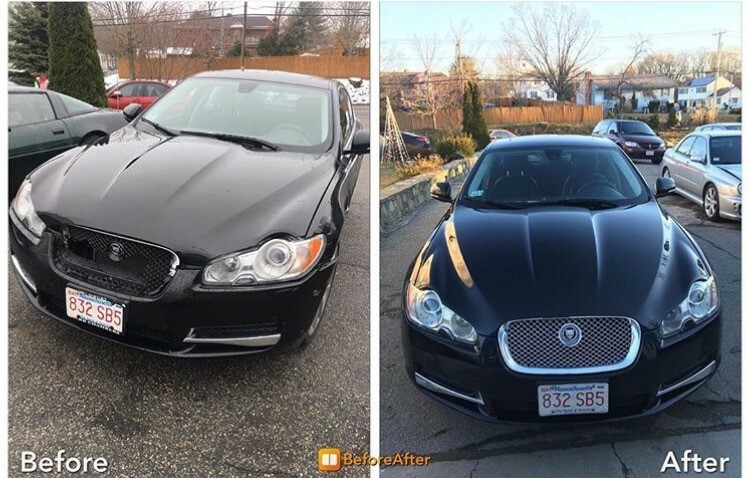 Drivers in Methuen, MA and the surrounding areas know they can trust us for a top-notch auto detailing service every time. Your vehicle will turn heads once we’re done with it! Customer service and satisfaction is our number one priority. We know that the continued success of our auto body shop hinges on putting our customers first. Therefore our goal is to continue providing the best auto body repair and auto detailing service with the highest possible standards. We keep your best interests in mind during every job. When you need quality auto detailing or auto body repair, call SK Auto Body. As one of the most trusted auto body shops in the area, we’ll give you a free estimate. Just call us at 978-686-5752 or 978-390-5752. We are happy to help. Remove all belongings, especially in the trunk, to prevent loss and damages and also to allow our technicians to access the damaged areas. Disable all alarm systems and write down your radio station settings, as they may be erased if the battery becomes disconnected. Bring all keys for any locked items including the trunk, wheel locks, spare tire locks, roof rack locks, etc. Bring your estimate information. This should include the name of the insurance carrier responsible, your policy number, your claim representative’s name and phone number, and your claim number. SK Auto Body is a reliable auto body shop that is both efficient and affordable. Our main goal is to provide the best repair service and leave you feeling satisfied with our work. We are an auto body shop that genuinely cares about you as a customer! For all your auto body repair and auto detailing needs, call SK Auto Body. Proudly serving Methuen, MA and all of Northern Massachusetts. Whether your vehicle has a scratch or needs complete auto body repair, our experts are here for you. We offer collision repair, auto detailing service, and more in order to get your vehicle back on the road looking its best after an accident. 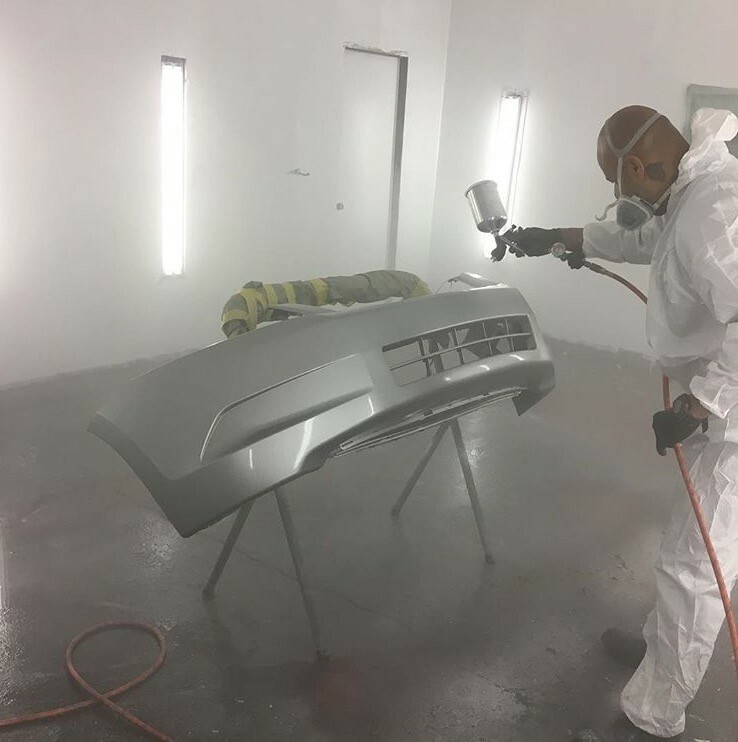 We have over 30 years of experience in car painting, detailing, frame work, body repair, and more. Give our shop a call today for your free estimate! I recently had an accident with my truck, I took it over to Sam at SK and he immediately got to work on it! He always returned my calls and got my truck back to me quickly! He even repainted my hood, which wasn't damaged in the accident, at no extra charge just because he had the time! Sam definitely took a lot of the stress and headache out of getting your car fixed, I'd highly recommend his services! Very Friendly, accurate estimates, professional service, went the extra mile! "Integrity is the word that comes to mind when you consider the work done at SK Auto. Our 2010 Honda civic has been hit four times in the past two years.The recent accident someone backed into it and caused $2,600 in damage. The insurance sent the first check for $825.00. SK auto requested two additional supplements to get the car repaired correctly. Sounds simple enough but the other body shops where we had the car repaired before did not do the repairs correctly even after we brought the car back multiple times. The paint was chipping and the car was not aligned properly. When SK sent the car to be aligned damage was found from an accident that happened almost two years ago. I did not think the insurance company would ever cover that old accident. Sam from SK auto did all the work in getting the insurance to send a supplement to pay for that old damage and I was able to have my mechanic repair the damaged knuckle in the front end and align the car. I won't mention the names of the other body shops but I would never trust any one else to repair any of my cars. I only wish I had brought my cars to this body shop for all my repairs. 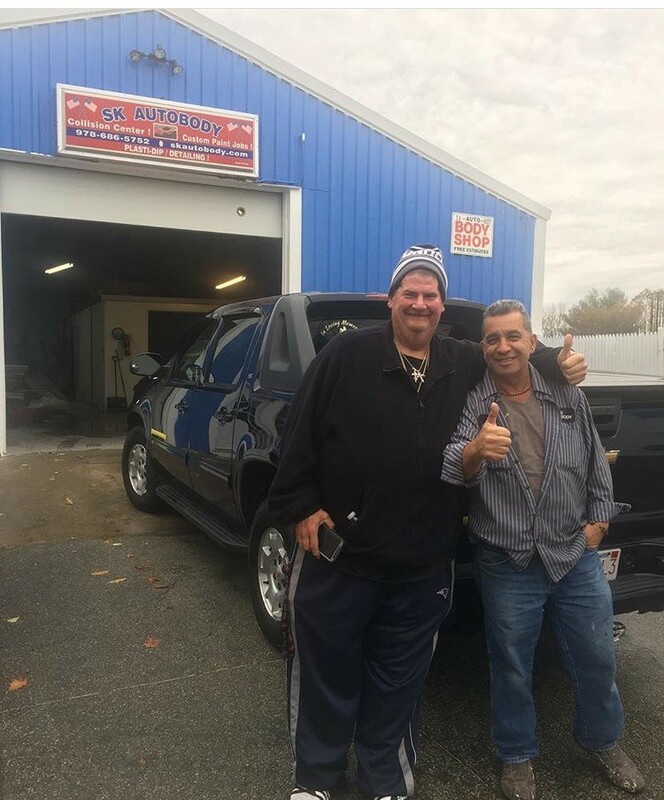 SK Auto went above and beyond anything I would expect.No headaches no problems just exceptional work.Sam is an honest man who cares about his reputation in the community and I would not hesitate to recommend him to family and friends. Sam took great care of my care. A big fender bender which looked unrepairable, Sam took in and gave me back my car looking brand new! Sam and his expertise is who people need to see when they are in a rut on who to go to for their car needs! Sam is fantastic! Thank goodness a car genius is in the neighborhood. From the moment when I arrived at SK Auto Body to drop off my son's vehicle until the moment I left, I felt so comfortable. The customer service was something you rarely see anymore, superb. During the entire time my son's vehicle was there, the owner kept me updated, without me even having to call once. He was kind, considerate, hard working, made sure my son's car was ready when he predicted it would be, but most of all, the owner treated me like family. I would recommend this company to any and all of the people that I know, because this company displayed above average skills, far superior than I have ever seen before. Kind hearted, compassionate prompt and a perfect job, well done... My son's car looks like it is brand new, amazing, you can not get any better than that. 15 year old vehicle and SK Auto Body made it look like it just came out of the showroom... ABSOLUTELY AMAZING! Exceptional prices, Job done when I needed it to be done, Superb customer service, paid very close attention to detail, very well kept business and last, but not least, the business was very, very clean. I just recently brought my 2008 Acadia to Sam and his employees. They were so professional, they took care of me like I was part of the family. Sam went above and beyond working with my insurance as well as setting me up with a rental car. My car looks better than it did when I bought last year from the dealership! Can't say enough, great work, great service! Wouldn't go anywhere else! Quick service, super nice, very professional, more than reasonable rates, the best place to get your car fixed for sure! My cars so clean and brand-new looking I don't want to get it dirty!!! Lol!!!! HIGHLY recommend SK Auto Body for any car service. Sam is very friendly, knowledgable and really strives to make his customers happy. He truly went above and beyond my expectations not only fixing my car but making it look like I was picking up a brand new car! Brought my 2004 Jeep in for rust on the front hood and to replace front headlamps. Upon review of my vehicle, owner Sam Kassis also noticed rust buildup on the bottom of the door panels that could become a major problem if not taking care of. He also suggested instead of purchasing new headlamps, he could clean and polish my existing headlamps (saved money). A few days later when I picked up my vehicle, I was amazed! It looked like a 2016 instead of a 2004. Also, none of the expenses were covered by my auto insurance, so it was all out of pocket for me. Based on the time involved and quality of the work, I feel that the final price was more than reasonable. I will highly recommend SK Auto Body to family and friends. They are the best! Quality work, honesty, fair prices, job done in a timely manner. I've had several cars worked on at SK Autobody, all with terrific results. The quote on the first vehicle was $400 less than the price given by the Toyota dealer and I've been a loyal customer ever since. Sam treats my cars as if they were his own! Excellent service!!!!! Best auto shop in the city of Methuen!!! Only shop open on a Saturday. My vehicle was fully repaired. I felt as if I was picking it up from the dealership. Sammy was very professional and puts his customer first!!! On top of fixing my personal vehicle and also repaired my rental free of charge!!!! He was a true blessing. Highly recommended!!!!!! My daughter's car received heavy rear end damage in an accident. It was her first accident, dealing with insurance adjusters, agents and car rental. Sam was great explaining the process to us. Just picked up the car, and couldn't be happier. Looks fantastic. Highly recommend SK Auto Body!! SK Auto Body did a fantastic job of repairing my car after a collision. They even fixed issues from a previous accident that another collision center apparently overlooked/ did not bother with. Thank you, SK Auto Body shop for treating your customers so well! I will be back to you for any future needs. Sam is a true professional! The worked he did on my car is incredible. My vehicle looks brand-new. Sam is a man of his word he told me he would get the vehicle done in a certain Time frame and did so. I'm very happy I decided to use SK Auto Body to repair my vehicle. I would recommend anybody to use SK for all your auto body needs! 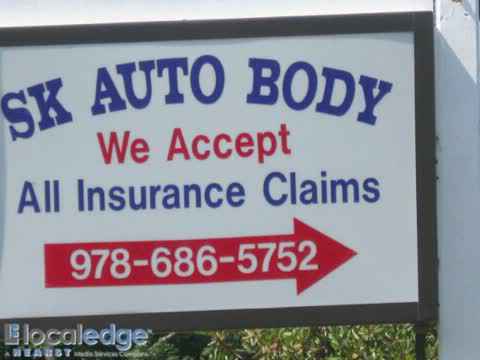 Last thing you need after an unfortunate car accident is auto body shop that gives you the run around. Sam put my mind at ease, dealt with the insurance company. The only thing I needed to do was drop my car off and pick it up. Friendly. Prompt. Reliable. Outstanding craftsmanship! Convenience. My sister was in a real bind - given her back windshield had been smashed including the frame around it. With both parents working full time and kids needing to be shuttled all around; Sam (the owner) quickly worked to coordinate with my sister's insurance to get her car repaired and back to her in very short order. Very personalized service. I was the one who picked up the vehicle when it was ready - and I also noticed a couple of extras Sam and his crew did for my sister during the quick turnaround. He earned my business when I have a need for auto body repair! Personalized service. Easy, quiet location. High quality work. I highly recommend Sam at Sk auto body if you're looking for a job done right. The SK team has repaired three of our cars now and every time the workmanship was OUTSTANDING. The first repair was a small fender bender ...the second a head on repair and the third was a full restoration of our 1968 Camaro Convertible. I can't say enough about Sam and his team. Not only do they do great work but Sam and his family are nice people to work with. Workmanship, Quality, He takes the time to do the job right. 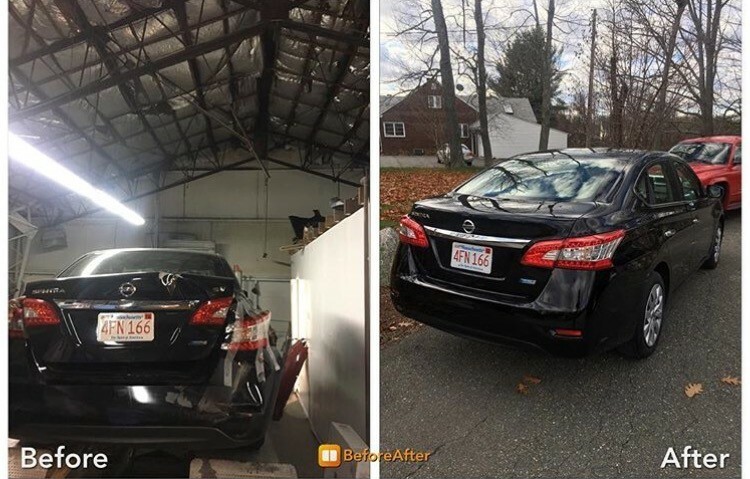 "This was the first time we had used SK Auto Body. We had an appraisal from the insurance company of the person that hit our car. Sam is very easy to talk with. He is honest and sincere. He even said he would fix a couple of small scratches included in the estimate amount. My wife and I were extremely happy with the finished results. The rear quarter panel looked as though it had never been hit. 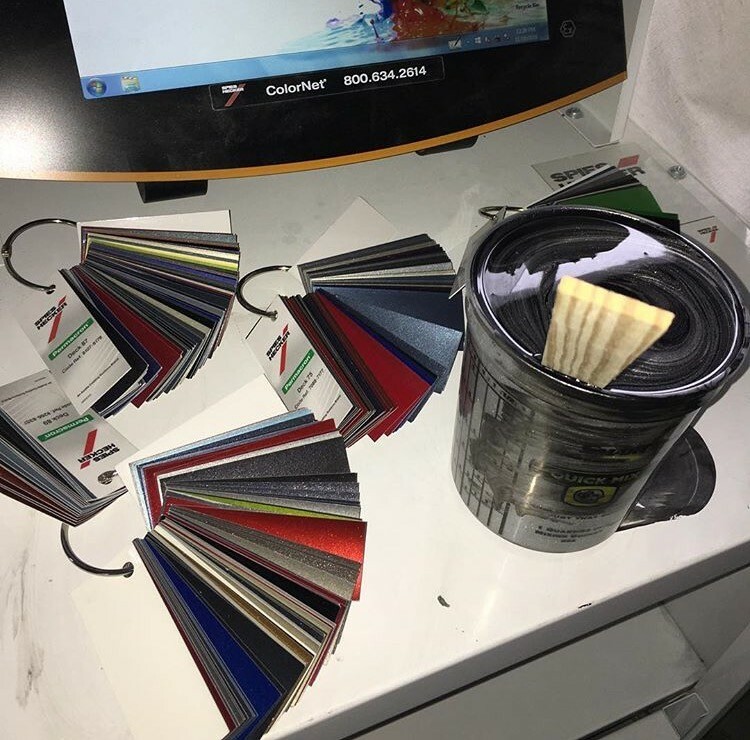 Sam blended the 3 stage paint perfectly and repainted the black pin strip on the door and quarter perfectly. We would recommend SK Auto Body to anyone." The owner's honesty and sincerity. He wants a satisfied customer above all else. The body repair was completed in a timely manner. Excellent workmanship. The driveway is a little congested with cars. Must use caution when entering and exiting the driveway. 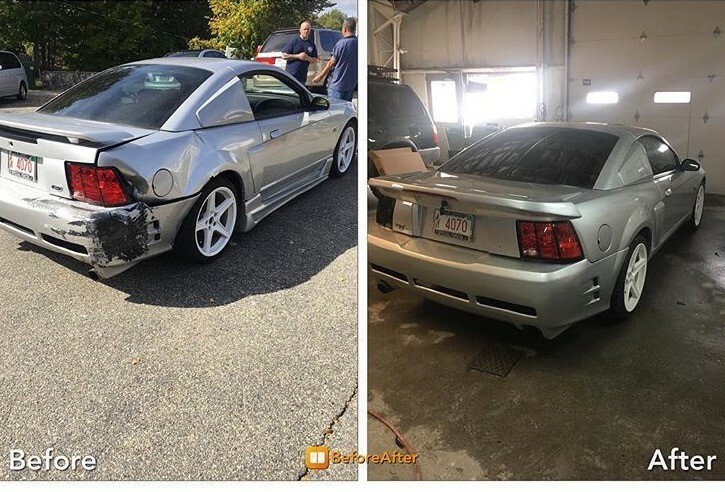 SK Auto Body team did a great job repairing my Ford Mustang. Definitely exceeded my expectations. The work was done in a timely fashion. The price was outstanding. The car looks like new. I am very happy with the service and professionalism and would absolutely recommend their service to anyone.